For researchers in anthropology and archaeology, the seemingly provocative agenda of Tim Ingold’s trailblazing headline “No more Ancient; No more Human. The Future Past of Archaeology and Anthropology” might evoke enthusiasm and frustration alike. The enthusiasm-reflex, relying on an unquestioned assumption that it is possible to “finally get things right”, originates in the promising prospects of leaving the beaten path built on dualistic schemes characteristic of modernist thought. This air of departure eventually leads to frustration: What does it mean to overcome the nature–culture or thing–human divide? 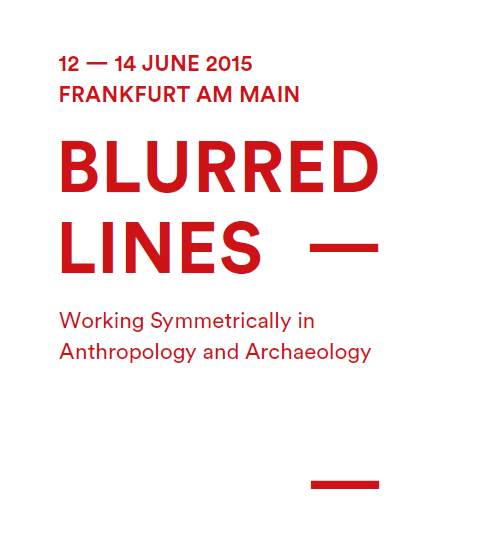 How to de-colonize anthropological and archaeological thinking? What happens if we take the other or the thing seriously and how would such a perspective change our way of working? The so called “symmetrical approaches” of inquiry inevitably challenge problems that derive from Western academic heritage leaving its mark on anthropological and archaeological thinking. However, symmetrical approaches are first and foremost a question of method; they engage in endeavours outlining anthropological or archaeological research in pragmatic terms rather than digging to deep into philosophical analyses. Instead of dwelling on theories forced on any research material, working symmetrically calls for a conceptual bedrock that evolves out of the engagement with the respective research material. In short, it calls for taking blurred lines and their re-composition seriously. work symmetrically. During the workshop participant’s research projects will occupy the workshop’s centre stage. Participants will tentatively map out a conceptual framework based on their own research materials as well as survey related methodological consequences. explicitly contribute to a theoretical discourse. However, theoretical involvement with symmetrical approaches is preferable and unavoidable in this exercise. Working symmetrically requires a bottom-up structure for the workshop that would disturb traditional method when a facilitator offers terms of involvement framed as encompassing abstract objects. Rather, every participant will creatively present and contribute his or her own research material to small working groups starting from details of his or her own material. Invited scholars familiar with symmetrical thought will function as mentors and encourage the participants to work symmetrically through their own research. The workshop will close with a final discussion round involving all participants, which will be preluded by a talk that will highlight issues and questions which arose during the workshop, evaluating its outcome. are provided for the duration of the workshop. own research project and material (including master/doctoral research/thesis) and the motivation to get involved with symmetrical thought. Master students, doctoral students and postdoctoral researchers are welcome to submit a motivational letter of 300 words (including personal information, project/material, and expectations) until 1 May 2015.